Fiesta is big! This Fiesta, things are about to get bigger! We are looking to you, San Antonio, for your help in inspiring our official Fiesta mural painted by Los Otros Murals’s Nik Soup and Shek Vega. 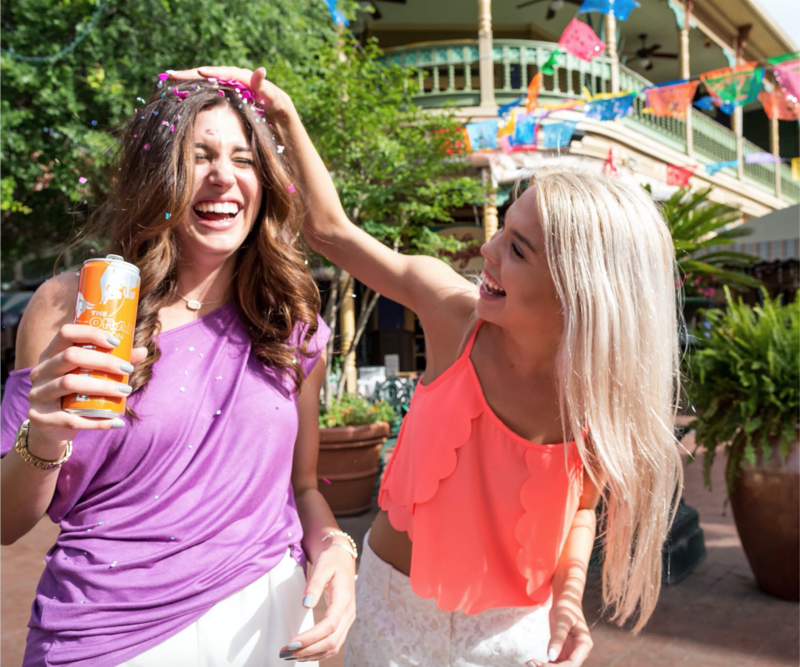 This is your chance to be featured in this year's mega mural celebrating this two week event by posting your favorite, fun, colorful, or outright crazy Fiesta San Antonio photos on Instagram. To enter, follow @FiestaSA and tag your photo with the hashtag #fiestamuralcontest between March 19 - April 2, 2018. Large decorative hats, costumes, friends, cracking cascarones? The more festive, the better your chance! Only you know what it is to truly be a San Antonian. Show us how you like to Fiesta! NO PURCHASE NECESSARY TO ENTER OR WIN. A PURCHASE WILL NOT INCREASE YOUR CHANCES OF WINNING. VOID WHERE PROHIBITED BY LAW. EXCEPT FOR THE MARKS OF THE SPONSOR (ADDRESSED BELOW), ENTRY MUST NOT CONTAIN ANY THIRD-PARTY TRADEMARKS, LOGOS, TRADE DRESS OR PROMOTION OF ANY BRAND, PRODUCT, OR SERVICE. PARTICIPANTS MUST HAVE AN INSTAGRAM® ACCOUNT TO ENTER. ELIGIBILITY: The Fiesta Mural Contest (“Contest”) begins on March 19, 2018 at 12:01 a.m. Central Standard Time (“CST”) and ends on April 2, 2018 at 11:59 p.m. CST (“Contest Period”). The time shall be determined by Sponsor’s timekeeping systems, and Sponsor may also rely on the time processing functions of third parties. Sponsor shall have the sole discretion in determining the timeliness of any action or inaction related to this Contest. The Contest is open to legal US, District of Columbia and Puerto Rico residents, who are at least 18 years old and the age of majority in their jurisdiction of residence as of the date of entry. Void where prohibited. Employees of Red Bull North America, Inc. (“Sponsor”), Fiesta San Antonio Commission, and their parent companies, subsidiaries, affiliates, advertising agencies, public relations agencies, prize suppliers, including any vendors providing services in connection with this Contest (collectively, the “Sponsor Affiliates”), and employees, agents, directors, officers (including members of their immediate family – i.e., spouse, mother, father, in-laws, grandmother, grandfather, brother, sister, children and grandchildren – or those living in the same household) of Sponsor or any Sponsor Affiliates are not eligible to participate in the Contest. Contest is subject to all applicable federal, state, and local laws. To participate, you must have an Instagram® account that is open to the public (an account where anyone can subscribe to follow your photos). You are not eligible to participate if your Instagram account is set to the private option (where a user must approve all follow requests). If you are not a registered Instagram user, you can download one of Instagram’s mobile apps to sign up for Instagram. There is no currently no fee to register for Instagram. c. Include @FiestaSA and the hashtags #fiestamural and #Contest in the post. During the Contest Period, you may enter as often as you wish. REQUIRED REPRESENTATIONS AND WARRANTIES: You must meet all of the following as applicable to your entry. Failure to do so may result in your disqualification. (ii) You have the express written consent of any identifiable persons appearing or referenced in your entry or entries to their Persona (as defined below) being used in the ways set out in these Official Rules, including Sponsor’s right to use your entry or entries for any future commercial purpose without restrictions. Upon request, you will obtain written consent of any such persons for Sponsor in the form identified by Sponsor. If any person appearing in any entry is under the age of majority in their jurisdiction of residence, the written consent and signature of a parent or legal guardian is required. (iii) Except for the marks of the Sponsor (addressed below), the entry does not reference any person other than entrant, or any names, products or services of any company or entity or any third-party trademarks, logos, copyrights, trade dress or promotion of any brand, product, or service. Sponsor grants you the limited permission to use its RED BULL mark in your entry solely for purposes of entering. You shall immediately cease any and all use of the RED BULL mark upon expiration or termination of this Contest. (iv) Your entry is appropriate for public viewing. Without limiting the foregoing, your entry is not lewd, obscene, sexually explicit, pornographic, disparaging, defamatory, libelous, or otherwise contain content which Sponsor in its sole discretion decides is inappropriate or objectionable. Your entry or entries must also not disparage or cast a negative light on any person, entity, or brand, product, or service. (v) Your entry complies with all of Sponsor’s and Instagram’s, as applicable, requirements and terms regarding the use of their services. You agree to reimburse Sponsor in full in respect of any losses, damages, and expenses, including reasonable legal fees (including, where permitted, reasonable attorney fees) that they may sustain from the breach of a representation or warranty made by you or the use of any rights granted by you to Sponsor hereunder. By entering, you warrant that your entry or entries comply with the requirements set out above including those at (i)–(v) above. By entering, you will and hereby do assign to Sponsor your full right, title and interest over your entry, including any and all trademark, copyright, publicity and other intellectual property rights related thereto. Whenever requested by Sponsor, you will provide the necessary documents regarding the assignment to Sponsor and you will execute any documents that Sponsor might reasonably request for such assignment. In the event, and to the extent, that you cannot assign your entry as a matter of law, you hereby grant to Sponsor a perpetual, irrevocable, exclusive, worldwide, royalty-free, sub-licensable, freely assignable license to reproduce your entry and to otherwise use, exploit, copy, modify, adapt, edit, publish and display the entry in any form, manner, venue, media or technology now known or later developed for any and all purposes, including, without limitation, for purposes of commercial or trade purposes, advertising, and promotion as Sponsor and its licensees or assignees determine, without further compensation, notification, or permission. Further, by entering, you hereby waive any moral rights you may have in any entry in favor of the Sponsor. By submitting your entry you also grant to Sponsor the worldwide, perpetual, irrevocable, fully sub-licensable, and freely transferable right, but not the obligation, to use any and all names, identities, titles, likenesses, distinctive appearances, physical likenesses, images, portraits, pictures, photographs (whether still or moving), screen personas, voices, vocal styles, statements, gestures, mannerisms, personalities, performance characteristics, biographical data, signatures, and any other indicia or imitations of identity or likeness listed, provided, referenced, or otherwise contained in the entry and/or image (all attributes, collectively, per person, a “Persona”) for purposes of advertising and trade, in any format, medium, or technology now known or later developed without further notice, approval, or compensation, unless prohibited by law. WINNER SELECTION: On or about April 5, 2018, after the conclusion of the Contest Period, a qualified Judging Panel chosen by Sponsor in its sole discretion will select one (1) Grand Prize Winner from among the eligible entries. The Judging Panel will judge the entries based on the following criteria (“Judging Criteria”), weighted as follows: (a) showcasing Fiesta traditions (34%); (b) creativity (33%); and (c) quality of the photo (33%). Odds of winning will depend upon the number of eligible entries received. The selected winners are subject to verification of eligibility and compliance with these rules. Limit one (1) prize per person and per household. To be clear, the Judging Panel may review multiple entries that submit similar entries; in such a case, the judges may consider the timing of such entries in making its decision but will not be bound to designate as a potential winner the first submission of such similar entries. The selected winner is subject to verification of eligibility and compliance with these Official Rules. PRIZE: Upon verification of eligibility and compliance with these Official Rules, one (1) winner will have their photo entry used as inspiration for a mural at the 2018 Fiesta San Antonio painted by Los Otros Murals’s Nik Soup and Shek Vega. All prizes are awarded "AS IS." Neither Sponsor nor Sponsor Affiliates make or offer any warranty or guarantee, either express or implied (including, without limitation, quality, merchantability and fitness for a particular purpose) in connection with this Contest or any prize. No issuer of any offered prize is sponsoring this Contest. Prize details and availability are subject to change, in which case a prize of equal value may be substituted at Sponsor's sole discretion. Prizes consist only of the items listed, are non-transferable, with no cash redemption or substitution except at Sponsor's sole discretion. Sponsor will determine all prize details (brand, model, size, etc.) in its sole discretion. Federal, state, or local taxes on prizes, if any, and any other costs, fees or expenses not listed above are the sole responsibility of each winner. NOTIFICATION: Potential winner(s) will be notified by direct message to their Instagram account. If potential winners do not respond to the notification within a timely manner, as determined solely by Sponsor, Sponsor may conduct additional random drawings to select additional potential winners. Potential winner must respond to the notification message within half an hour of the announcement and provide all requested information within twenty-four (24) hours of the first contact or attempted contact from Sponsor. Sponsor may require winner(s) to complete, sign, and return an Affidavit of Eligibility/Liability Release/Publicity Release forms and other applicable documents. All required documents must be completed and returned to Sponsor within two (2) days of the date and time listed on the documents, but in no event later than the start of the Event. If a potential winner cannot be contacted, is disqualified, fails to timely execute and return any required forms, an alternate winner may be selected from among the remaining eligible entries. To be eligible to BE DECLARED the winner, you must transfer all intellectual property rights that YOU do or may have in the ENTRY TO SPONSOR. By entering potential winner expressly agreeS to complete all paperwork required to complete this transfer (the “Intellectual Property Assignment”) before YOU will be declared THE Winner. NO LIABILITY & INDEMNIFICATION: By entering this Contest, you agree to release, discharge and hold harmless Sponsor, Sponsor Affiliates, Fiesta San Antonio Commission, Instagram, Inc., and their respective directors, officers, employees, agents and assigns (the “Released Parties”) from any claims, losses, and damages arising out of, or relating to, your participation in this Contest or any Contest-related activities (including, without limitation, the concert) and the acceptance and use, misuse, or possession of any prize awarded hereunder (including, without limitation, any misrepresentation made by you in connection with the Contest; any non-compliance by you with these Official Rules; claims brought by persons or entities other than the parties to these Official Rules arising from or related to your involvement with the Contest; acceptance, possession, misuse or use of any prize or participation in any Contest-related activity or participation in this Contest; any malfunction, error or other problem arising in connection with the collection, processing, or retention of entry information; or any typographical or other error in the printing, offering or announcement of any winner). The foregoing includes, without limitation, any claim for personal injury, property loss or damage, or death arising in any way in connection with the Contest. If Sponsor’s use of your entry causes Sponsor to be subject to a claim by any third party (including, but not limited to, a claim of infringement), you agree to indemnify and hold harmless the Released Parties, and all persons acting by, through, under or in concert with them, against any and all damages, costs, judgments and expenses (including reasonable attorney’s fees) which the Released Parties (or any one of them) may incur as a result of the use of your entry. NO AFFILIATION WITH INSTAGRAM: This Contest is in no way sponsored, endorsed or administered by, or associated with Instagram or any other named or depicted people or entities other than Sponsor and Sponsor Affiliates. Any questions, comments or complaints regarding the Contest should be directed to Sponsor. WINNER ANNOUNCEMENT: To obtain a list of winners, visit fiestamural.redbull.com, after April 6, 2018.
c. Include @FiestaSA and the hashtags #fiestamuralcontest in the post. (1) Grand Prize Winner from among the eligible entries. OTHER TERMS: Decisions of Sponsor on all matters related to the Contest are final and binding. Sponsor reserves the right to cancel or modify the Contest for any reason, including but not limited to, if fraud, misconduct or technical failures destroy the integrity of the Contest, or if a computer virus, bug, or other technical problem corrupts the administration, security, or proper administration of the Contest as determined by Sponsor, in its sole discretion. Sponsor reserves the right to disqualify or prohibit the participation of an individual if fraud or tampering is suspected, or if the individual fails to comply with any requirement of participation or with any provision in these Official Rules. CAUTION: ANY ATTEMPT TO DELIBERATELY DAMAGE OR UNDERMINE THE OPERATION OF THIS CONTEST MAY BE A VIOLATION OF CRIMINAL & CIVIL LAWS. SPONSOR RESERVES THE RIGHT TO DISQUALIFY AND/OR SEEK DAMAGES FROM ANY INDIVIDUAL MAKING ANY SUCH ATTEMPTS TO THE FULL EXTENT PERMITTED BY APPLICABLE LAW. WINNER ANNOUNCEMENT: To obtain a list of winners, visit redbull.com/fiesta, after April 6, 2018. The Red Bull Editions give you the wings of Red Bull Energy Drink with the taste of Tangerine, Blueberry, Kiwi Apple, Cranberry and Tropical Fruits. Want wings without the sugar? Introducing the NEW Red Bull Editions with the taste of Açaí Berry and Limeade – Sugarfree!